Yesterday’s grading of 7.5 from a walk out on the lake yesterday turned out to be optimistic. It has been a long frustrating winter. About a dozen boats turned up to sail in a somewhat fluky NW wind. It was cold and the ice was fast resulting in the blemishes that seemed minor on foot became rather intrusive at speed. The result was damage to four boats that the boats themselves probably felt was abusive. The most serious was a spiral fracture of the springboard of Chris Conary’s nice old Yankee that he has justgottentosail. .This might be glueable but Chris says he has a piece of wood for the replacement. The most unusual was Dave Fortier breaking off the end of his Super DN plank. 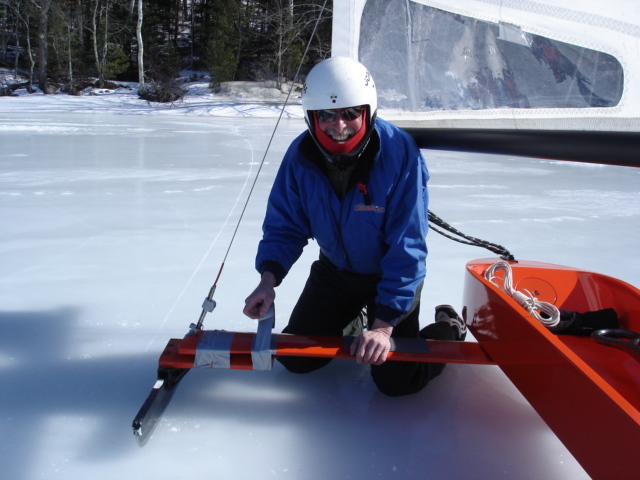 Cheapskate was sailing around enoying the ice scape when he saw Dave carrying something across the lake toward the far shore where his boat seemed parked. What he was carrying was his starboard runner and a foot long stub of plank. They met at his boat where, with parking brake off it was resting tilted toward the missing appendage. It seems that when the runner came off Dave got out, picked it up, and assuming the boat would go no where on two runners didn’t set the front runner brake. The boat sailed off on the two remaining runners all the way to the far shore. Now what? It was a long drag to the pits. Cheapskate to the rescue of course. He pulled up to the crippled Super DN and offered a roll of duct tape and a coil of frozen line from his ice lined (the rain got in) lunch and parts department. 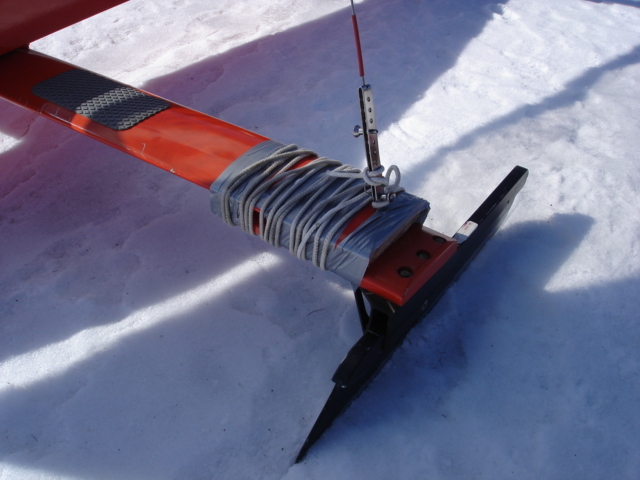 Fortier applied the duct tape and coiled the frozen line tightly over the fracture. The stiff line bit into the tape to resist sliding around and Fortier saileduneventfully home to the pits. 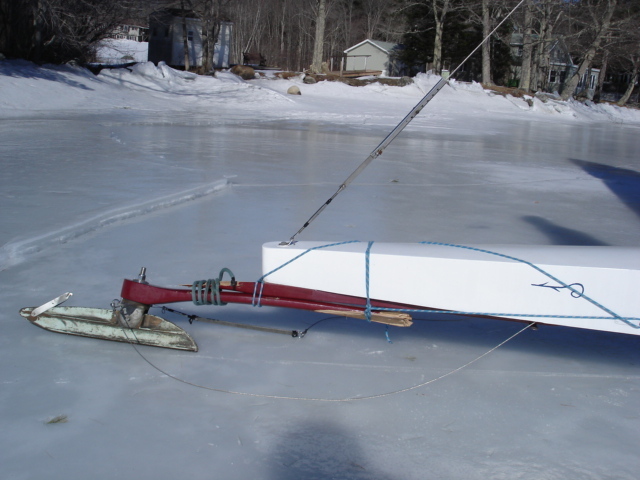 Jory wanted to sail Cheapskate and suggested I take his icy wood for a ride, offer accepted. I had heard that Jory had torn his plank loose in the narrows so I looked down at the plank attach plate and wiggled the plank which produced a merry dance of twinkling small screw heads down in the attach plate screw holes. I declined the generous offer and queried Jory when he got back. “Oh, not to worry I have been sailing the bejesus out of it since then”. I wasn’t sure how much bejesus there was left. Dammy Ice degraded to 5.5. Hope to see you there tomorrow warts and all, still a lot of lovely ice to sail.